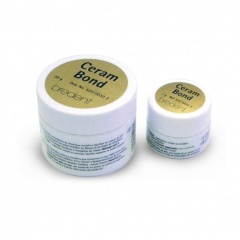 CeramBond provides increased reliability with all alloys and protection against debonding. CKB ensures a perfect bond between porcelain and chrome cobalt, fully compensating for differences in their thermal coefficients of expansion. CeramBond is a ceramic material which is used as a layer between all metals and ceramic. It is premixed and ready-to-use. Ceram-Bond is applied immediately after finishing, sandblasting and cleaning the metal framework to improve the bonding with the ceramic materials. This micro-fine layer improves bonding of the ceramic material to the metal framework, protects against debonding and offers increased reliability. It compensates differences in the expansion coefficients between metal and ceramic and blocks escaping metal oxides. CKB reduces the problems for alloys with strong tendency to oxide layer formation. 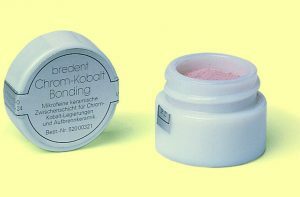 The microfine layer of bonding material ensures a perfect bond between the porcelain and chrome cobalt, fully compensating for differences in their thermal coefficients of expansion. Chrome Cobalt Bonding protects agains spalling and avoid time-consuming remakes.